This was an interesting one, and I thought you'd like to join me on this trip. 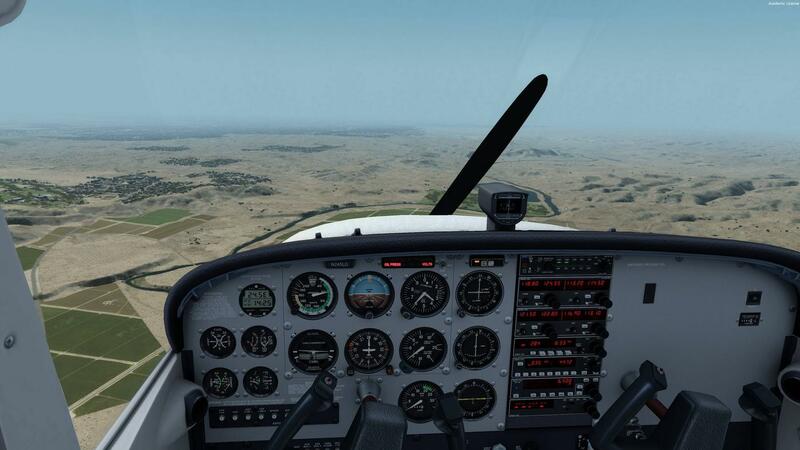 For the last two months I've been exclusively flying the Accusim Cessna 172, and although I love the faster, more complex aircraft, the 172 one has surely not aged one bit. It's beautifully modelled, and fantastically immersive. The reason for the exclusive 172-ing is because of PilotEdge, which has won me completely over. I wanted a basic trainer for that use, and I have learned so much the last months that I can't believe it. 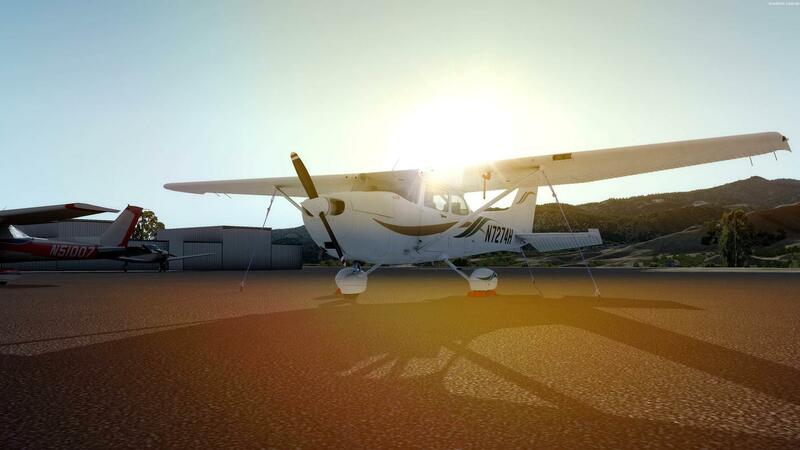 I started with a "fresh" new 172 for the training in SoCal with PilotEdge, my original 172 still having it's hours from the first flights back in September of 2013. It is still in use, sitting in western Canada somewhere. The reason for bringing this up is that I got an interesting insight into the world of Accusim from flying two different 172s - they aren't the same planes! My original 172 has been relatively stable, only needing regular maintenance (oil, filters, and the odd tightening of bolts). - I've experienced a binding elevator during flight. It woudn't go further down than about neutral. No problem landing, but quite scary. - I've had water in the fuel, something I've never have had before. - Clogged up stall horn - fantastic detail. Never thought I'd see something like that. - Various aileron problems, all spotted during preflight. - Many filters needing change, often, and oil gunking up fast. Having returned to California after a long round trip over a week or two: Lake Tahoe - Salt Lake City, to Denver via Aspen, to Grand Canyon via Albuquerque, Las Vegas and then to my departure airport in question: Kern Valley (L05). 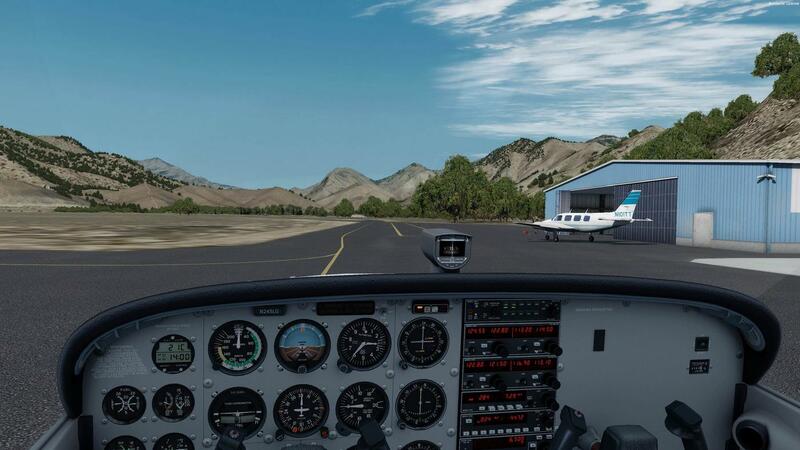 Kern Valley is a beautiful airport situated on the brige of the southern foot of the Sierra Nevada Mountains. The plan was to cross Isabella Lake and follow Kern River south-west to Bakersfield, and then head west to the coast, following the coast up to Northern California to Half Moon Bay. A good, long flight, covering amazing terrain and some interesting airspaces. Beautiful plane in a gorgeous airport within impressive terrain. It likes to pose, doesn't it? Well, why not? 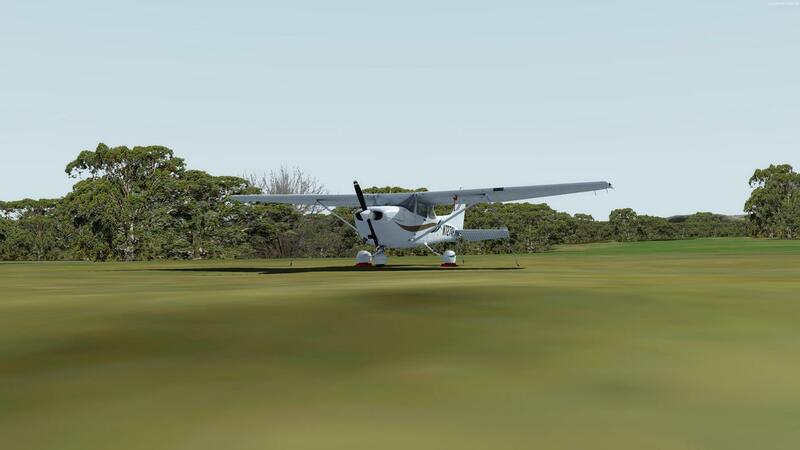 Preflight finished, noting that the flaps need tightening at some point, but no particular rush. The oil was low, however, and as always in this particular plane, dark and smudgy. An oil change will be needed when I get to a suitable airport (about 50 hours on the tach since I last had the plane for service at Long Beach Airport). Situated within the Isabella MOA (Military Operating Area), there seems to be some activity here today. Here can be seen 4 extremely fast moving targets a couple of thousand feet above Kern Valley airport. MOAs are usually not dangerous, but one has to pay attention. I've already coordinated flight following with Joshua Approach, so I already have a squawk code and will call them as soon as I'm airborne. RPM - as expected according to pressure altitude and so forth. Engine - instruments "in the green"
The engine on this 172 seems consistently to want to be hotter than my "original" 172, and I'm opting for a cruise climb, only leveling off for a while to be below this Mooney headed into the mountains toward Kern Valley. - "Cessna 5LG, the Bakersfield airport 1 o-clock, 12 miles"
- "Allright, I'll try to make it, and I'm declaring an emergency, Cessna 5LG." - "Cessna 5LG, roger, when able say souls on board and fuel remaining in minutes." 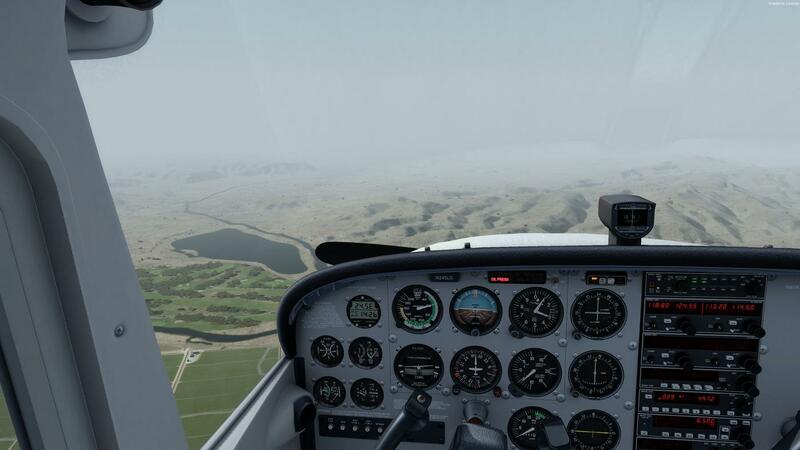 I opt for a lower power setting to postpone the inevitable, and start trading my speed for as much altitude as I can until reaching best glide speed. The engine starts sounding like it is less than fully happy, gratually looses power, and abruptly and fatally seizes. Being 12 miles from Bakersfield, I'm almost out of the mountains, but I had gained (I think) my cruise altitude of 6500 feet by then, so I had some minutes to glide. - "Bakersfield Approach, my engine just seized, and I have to put it in a field somewhere, Cessna 5LG." 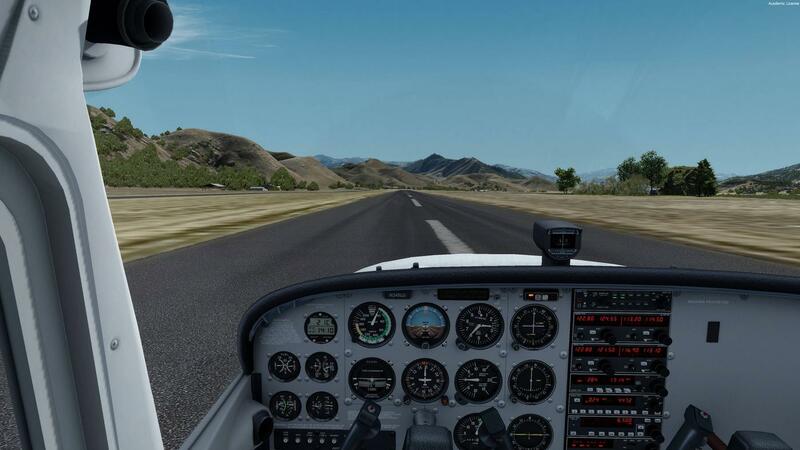 - "Cessna 5LG, roger, Bakersfield airport is 1 o-clock 9 miles now, do you think you can make it?" I've found several fields, and look for the direction I want to land in. I want to be flush with the plowing directions to minimize risk of being added to the plowage. Looking at the low voltage light and thinking that I might need flaps to land, I start turning off unneccessary lighs and radios to save the battery. Having the lights off, most of the radios off (leaving the transponder on), ignition and fuel off (trying to restart not worth even attempting with those symptoms), I'm squared away, gliding, the low voltage light for now happily extinguished. 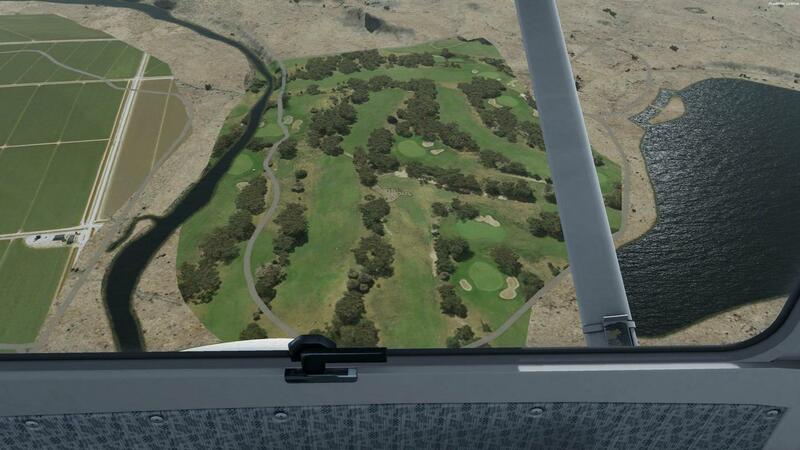 - "I see a golf course near some of the fields here, Cessna 5LG, I'm going to try that." - "Cessna 5LG, roger, emergency responders has been notified, just advice me when you're on the ground." After gliding for a couple more minutes to shave off altitude, I'm turning a slow base for the long northern-pointing doglegged fairway seen just above the window latch in the above picture (I'm in a sort of left crosswind in that picture, just for clarity's sake). Touchdown point is to be just after the creek(?) in the dogleg. Should be sufficient if I manage the speed well enough. - "Be advided, I'm going to ditch in the golf course in a few minutes now, Cessna 5LG, so I'll turn of my electricity while landing." 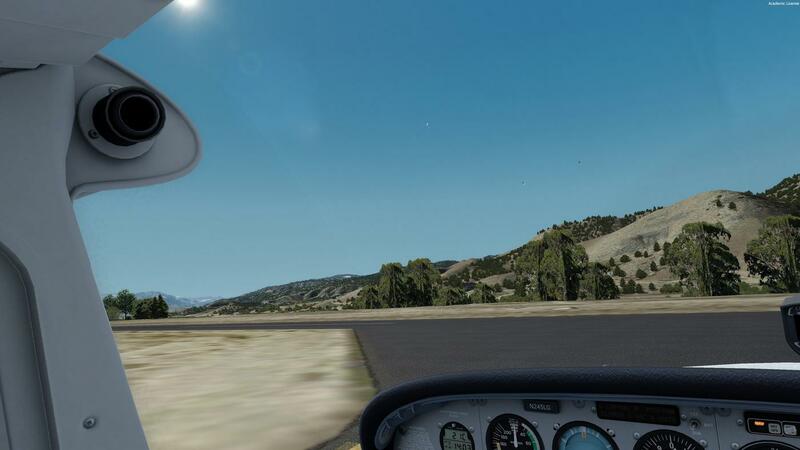 - "Cessna 5LG, roger, no problem, radar services terminated, and ahhh... good luck!" - "Thank you, Cessna 5LG." Dropping flaps, master switch off. Had my co-pilot and luggage transported to Bakersfield Municipal (L45) to have lower take off weight, and flew safely out of Kern River golf course. Resumed trip to Half Moon Bay, and all is well, an experience richer and with a fondness for liberal cruising altitudes for that added safety margin. 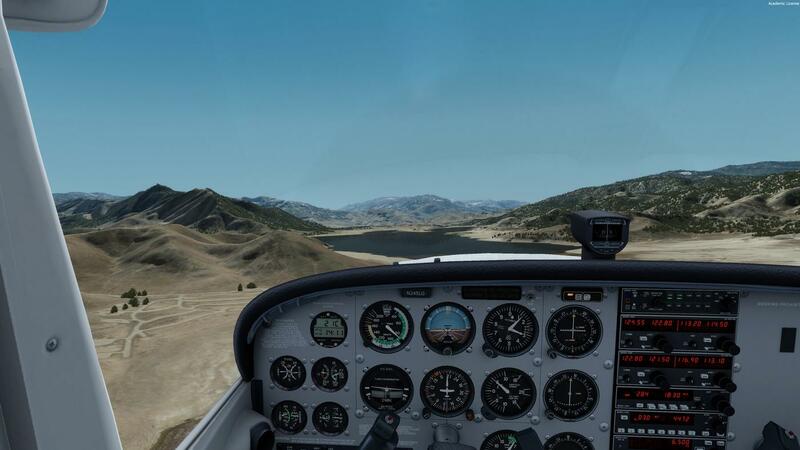 All this is thanks to the realism and immersion supplied by A2A's Accusim, obviously; Orbx' SoCal and the fidelity it brings; and PilotEdge for all kinds of learning about flying and for assistance (for whatever it was worth in this particular instance). The transcript of the ATC is lifted from the "tapes" on PilotEdge. 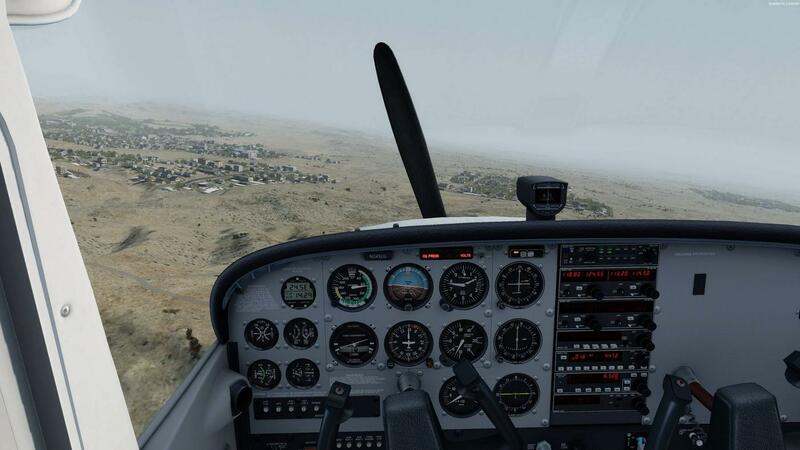 These are the best of times to be a flightsim enthusiast! Hope you all enjoyed reading this! Outstanding post! What a great experience, with none of the real world risk. Thanks for sharing that and the beautiful photoscenery! Great job, thanks for taking the time. Good thing the golf course had tie downs available. Thanks for reading this, guys and gals! That Cessna just passed 100 hours last night, flying to Vegas. It runs great now, but one never knows what can happen. There might be a new story coming (if I live to tell it). Good post. I do like a good read with pictures! Ren wrote: Was interesting to read! Do you have more stories? 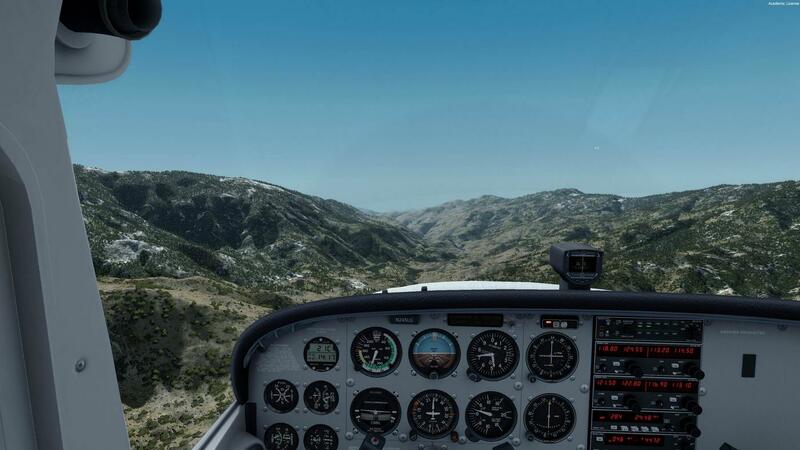 Sure, if you're up for an epic, I have made a enormous post on A2A on my journey flying the A2A Cessna 182 home to Norway from Connecticut, USA --- via The Caribbean, Southern America, Africa, and all the way through Europe. This is before my PE-days, and thus lacks that, but the scenery and stories are great.